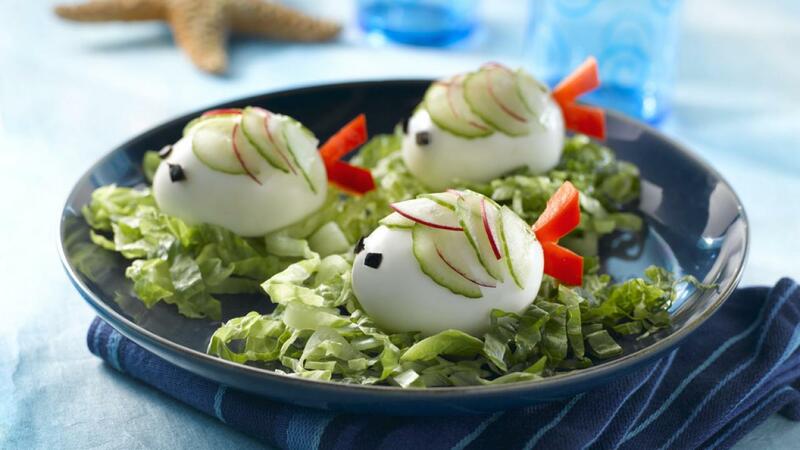 These egg fish make a fun appetizer for kids and adults alike. Hard boiled eggs form their little fishy bodies, with scales made from thinly sliced cucumbers and radishes. Garnish with a red pepper fin to create the tail and you’ll be swimming in compliments! To make fish, cut small slice off one long side of each egg so that it will sit flat. Cut four 1-inch (2.5 cm) V shapes from red pepper to make tails. Cut radishes and cucumber slices into halves or quarters to resemble scales. Using mayonnaise as glue, place cucumber and radish scales on each egg, covering back two-thirds and leaving space on narrow end for face. Cut tiny cubes from black olives to make eyes and place on the face. Cut slit into opposite end of each egg and insert red pepper tail. Surround eggs with shredded lettuce to reemble seaweed. Basic method for hard boiled eggs: Place cold eggs in single layer in saucepan. Cover with at least 1-inch (2.5 cm) cold water over top of eggs. Cover saucepan and bring water quickly to boil over high heat. Immediately remove pan from heat to stop boiling. Let eggs stand in water for 18 to 23 minutes. Drain water and immediately run cold water over eggs until cooled.